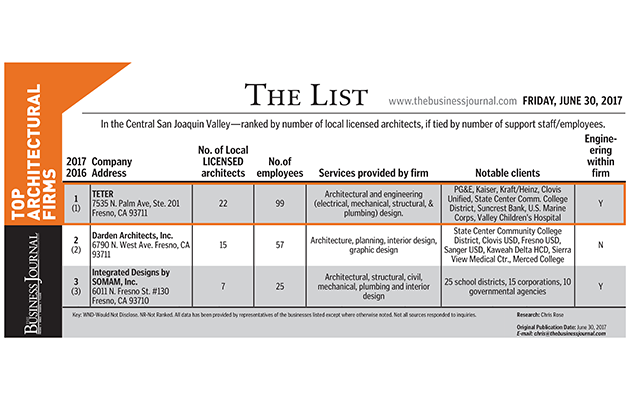 TETER is honored to be listed by the Business Journal as 2017’s top ranking architectural firm. This ten (10) consecutive year achievement is made possible by our staff’s dedication to the 3 Cs: Commitment. Connection. Community. • Commitment to fulfilling our clients’ needs and exceeding their expectations. • Connection amongst each other to design buildings that enhance the built environment. • Community involvement and investment to build a better valley. Hiring the best and brightest architects, engineers and designers over the past four decades has transformed us from a one-man shop to an almost one hundred-person company. TETER hopes to continue providing leadership in the A/E profession for generations to come.